After two years of planning and construction, the Porter Creek Streamflow Enhancement Project, funded by the CA Wildlife Conservation Board, E. & J. Gallo Winery, and Sonoma RCD is functioning and releasing water to benefit coho salmon in this critical spawning and rearing stream. In 2014, during the historic drought, Gallo offered to release water from an irrigation reservoir on one of its properties to benefit the endangered coho in adjacent Porter Creek. 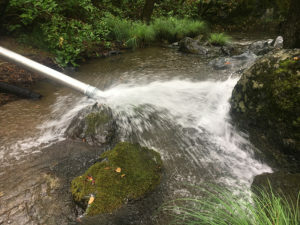 Employees recycled old irrigation pipes and built a temporary system to release water, but they realized that a permanent system was needed to ensure survival of the coho through future droughts. With generous support from the Wildlife Conservation Board, the permanent system is now in place and releasing water into Porter Creek. Each spring the system will release flows that mimic storms that will allow year-old coho smolt to migrate out to the Russian River. In the summer and fall, a small continuous flow of water will be released that will ensure that coho have enough habitat to survive until the winter rains arrive. In addition, a group from UC Berkeley will be studying fish habitat response to the streamflow augmentation. The results of this study will provide resource agencies and key stakeholders with critical information about the relationships between streamflow and fish habitat. The study will also aid in the prioritization, design, and evaluation of other flow enhancement projects, inform regional instream flow recommendations, and support planning for emergency drought actions, such as fish relocations.